Filson Padded Computer Bag. 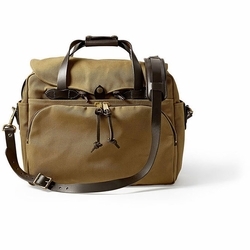 Filson's multi-pocket, rain-resistant computer bag has a padded laptop compartment and interior sleeves for organization. It includes a Bridle Leather shoulder strap and handle, and storm flap closure for added weather protection.